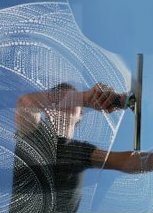 Customer satisfaction is our top priority, we offer our customers a ladderless and eco friendly window clean experience. No more ladder damage or soap in your flower beds or lawn, we operate an environmentally friendly service. We offer a flexible service to suit your needs seven days a week. Whether our services are required weekly, monthly or as a one of we can assure you of our total commitment and best service every time. 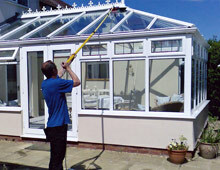 Conservatories and in particular their roofs can quickly collect dirt such as leaves and moss and a build-up of grime. This can be very difficult to clean, but with our ladderless purified water system we can remove any dirt easily and leave your conservatory and its roof looking as good as new. Solar panels are one of the most difficult products to access for cleaning. Over time solar panels will develop a build up of dirt and pollution from the atmosphere. This will reduce their sunlight capture which will lower their efficiency. To prevent this we strongly recommend that Solar Panels are cleaned annually to maintain their maximum performance. Our system also allows us to reach a height of 60 ft. from the ground. This eliminates the need for expensive scaffolding and walking on your roof which can cause tile damage. For solar panels cleaned professionally and cost effectively Brinkman Cleaning is the obvious solution.